This review will be more meaningful if the two reviews referenced above are read first. My music library is stored on a 6 TB hard drive housed in a Rosewill Armer 304X-APU3-35B fanned aluminum enclosure with eSATA and USB 3 interfaces. It connects to the BDP-3 via the BDP-3's excellent sounding dual bus USB-3 interface. Details of my listening evaluation methodology are covered in detail in the BDP-3 and iPower power supply review threads, therefore I won't rehash them here. There are not a lot of audio(phile) grade USB 3.0 cables on the market. The consensus among manufacturers appears to be that USB 2.0 is "good enough". Figure 1. USB 3.0 cable test set up. As I went from the stock cable to the two iFi Audio cables, the background became quieter, images became more solid, harmonic overtones and decay increased, and tactile sensation increased. background sounds became more defined. The noise floor was lowered as evidenced by the music becoming apparently louder. With the Mercury3.0 with the USB 3.0 B plug, there was a little more breath sound between a singer's notes, there was more "edge" and "chest" in male vocals. Bass notes had an added undercurrent of microgrowl and more speed and articulation. The Amazon Basics USB 3.0 cable was a disaster. It imparted an overall loss of detail, and the noise floor was raised as evidenced by the music becoming apparently lower in sound level. Piano notes became cold and steely and the pace and rhythm of the music seemed slower. Bass had a "thumping" and "droning" quality added to it. Finger snaps sounded like "clicks". Some of the ambient sounds, like the secondary piano echo on the left and the high hat echo on the right in the song "Saxy" disappeared. The sound quality of the two USB 2.0 cables was analogous to turning down a light dimmer switch. The RAL and Pangea didn't sound bad like the Amazon Basics 3.0 cable, there was just a loss of clarity and detail. With the dual leg RAL cable, the signal leg was plugged into the single USB 3.0 port on USB bus 1. The power leg was plugged into the adjacent USB 2.0 port. The power leg can be unplugged once the USB "handshake" process is over. I did not hear a difference whether the power leg was plugged in or not. The stereophonic performance evaluations noted for these cables are for this particular equipment configuration. 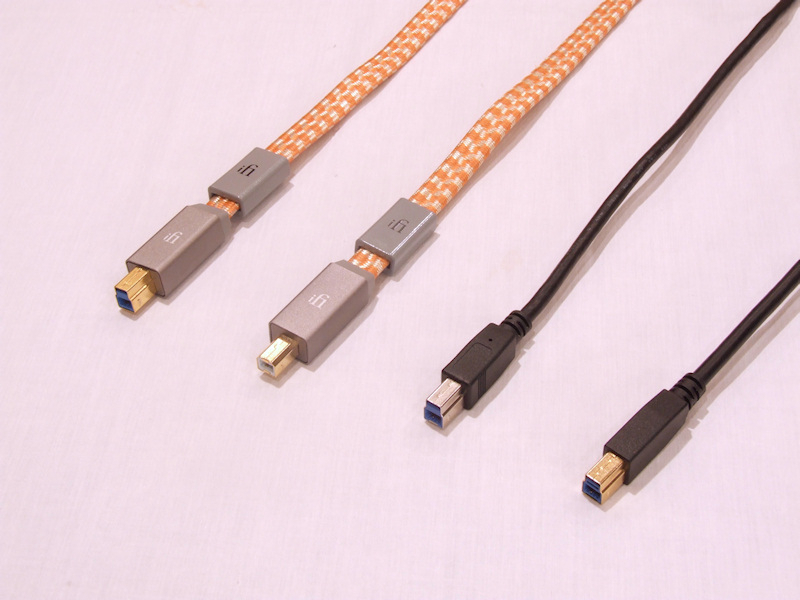 A cable that performs poorly in one equipment scenario may perform well in another, and vice versa. Figure 2. Four USB 3.0 cables - left to right: iFi Audio Mercury3.0 (USB 3.0 B plug connector), iFi Audio Mercury3.0 (USB 2.0 B plug connector), Stock USB 3.0 cable that came with the Rosewill enclosure, Amazon Basics USB 3.0. Figure 3. 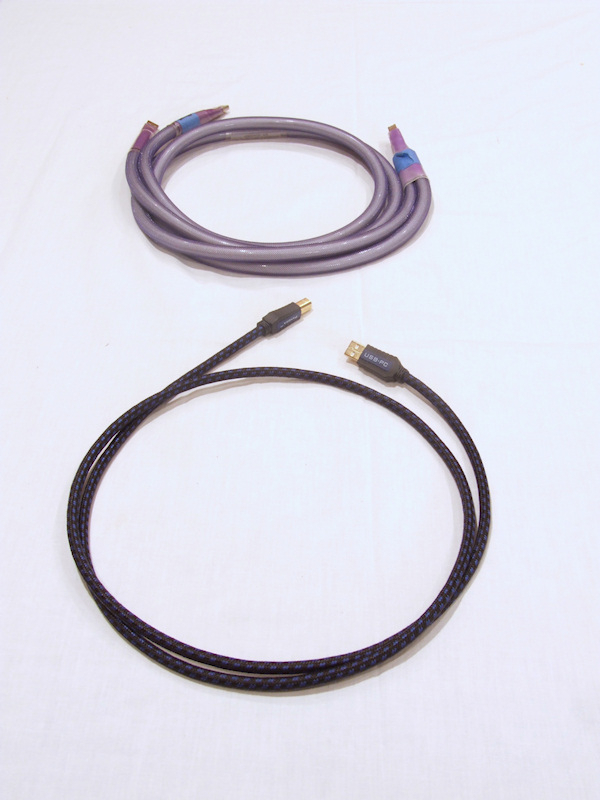 USB 2.0 cables - Revelation Audio Labs Prophecy CryoSilver dual leg (top), Pangea USB PC. I was quite surprised at how well the stock cable held up against some stiff competition. 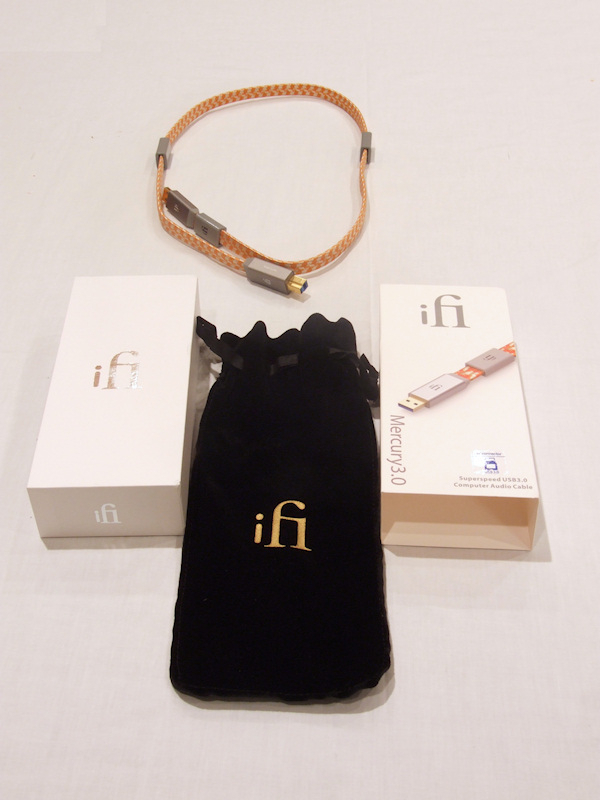 I was similarly surprised by the sound difference between the two iFi cables. I was most surprised by the poor performance of the Amazon Basics cable. Figure 4. Mercury3.0 uses a minimum inductance parallel conductor arrangement. 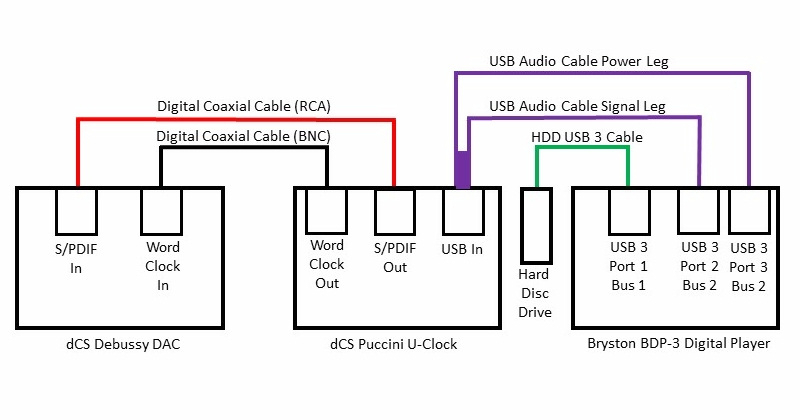 Some computer grade USB 3.0 cables use a similar arrangement. The flat cable design allows the power conductor to be placed on one end far from most of the signal conductors. 1. Drawn from 99.99% pure oxygen free high thermal conductivity (OFHC) copper made in a continuous casting process. 2. Copper wires are silver plated. 3. Conductor sizes are 24 AWG (power) and 28 AWG (data). 4. High density polyethylene insulation. 1. Quadruple shielding of audio wires for rejection of radio frequency and electromagnetically induced noise. 2. Flat (parallel) wire arrangement with power wire located on one side away from most of the audio (data) wires. 3. Three custom-made movable metal oxide ceramic radio frequency noise silencers. e) with all three silencers in the middle. I achieved the best sound with the best clarity, detail, and lowest noise floor with all three silencers in the middle. There are two sources of radio frequency interference (RFI) and electromagnetic interference (EMI) that are close to the hard drive enclosure, USB 3 cable, and BDP-3 digital player: The right side Pass Labs X600.5 monoblock power amplifier and the Amped Wireless 5 GHz range extender that provides network connectivity for the BDP-3 digital player and P10 AC regenerator. Figure 5. Mu-metal sheet, 13" x 17" (0.062" thick) foreground, stack of four cold rolled steel sheets, 17.5" x 19.5" (0.1912 total thickness) background. More shielding wasn't more better. I thought if some shielding was good, more shielding would be better. Not this time. The sound character of the instruments did change a little with a stack of steel sheets or a single mu-metal sheet placed on the shelf under the hard drive enclosure and USB 3 cable. With the steel sheets, the pops, snaps, and crackles in the vinyl surface noise of "Saxy" were muted a bit.There was less metallic "zing" in the bell tree flourishes. The weight and overtones of piano notes were diminished and overtones were truncated. 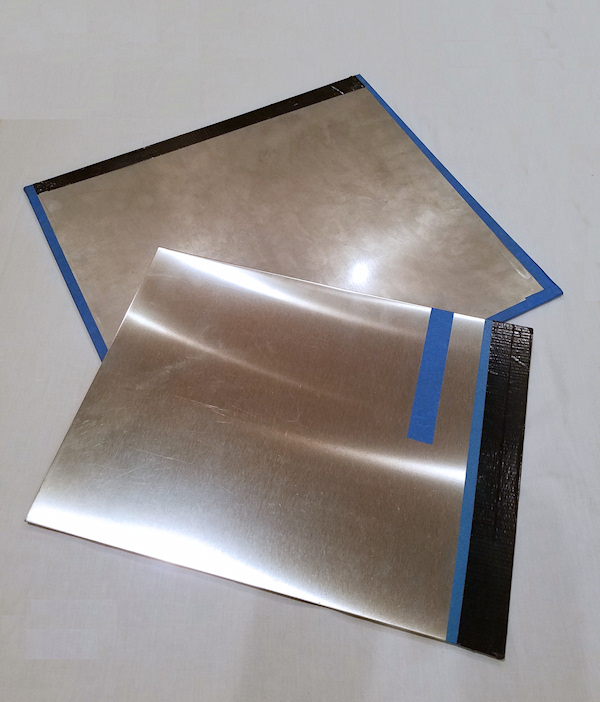 With the mu-metal sheet, the sound level balance between background and principle instruments was changed. For example, on "Saxy", the vinyl surface noise and background percussion instruments like the bell tree and shaker were lower in sound level and had less overall detail. The mu-metal sheet was very effective in shielding my former Pass Labs XP-25 phono preamp from hum induced by the EM field of the X600.5 power amplifier below it. It didn't work well in this application. Figure 6. The Mercury3.0's packaging consists of a slip-cased heavy cardboard box and an embroidered velvet bag. The metal ends and ceramic noise silencers were wrapped in small clingy blue plastic sheets. Figure 7. The Mercury3.0's connectors are machined entirely from solid, aircraft grade aluminium and provide end to end radio frequency shielding. Figure 8. The Mercury3.0's jewel-like connectors and exotic orange and champagne colored silky jacket braid fit in well with my two channel stereo's assortment of boutique audiophile interconnects and power cables. 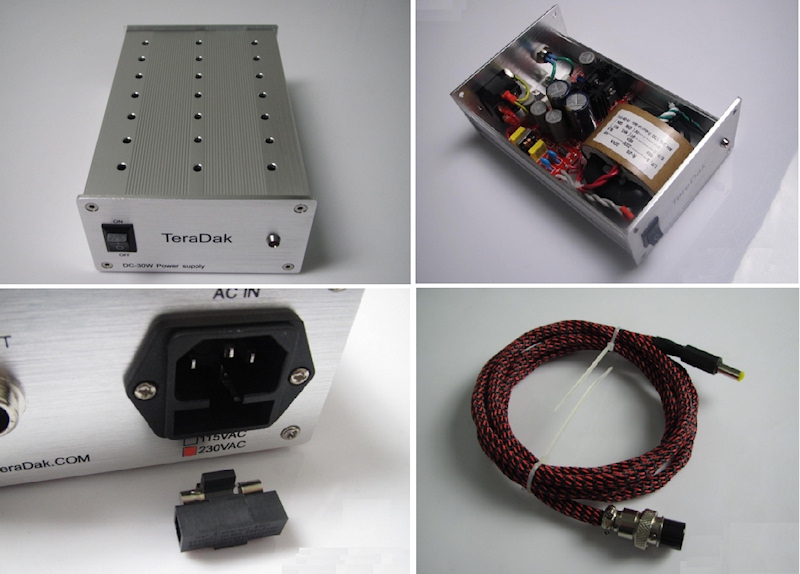 A TeraDak Musical Fidelity V90-DAC HiFi linear power supply that outputs 12 volts and 2 amps is on order. It will be evaluated as a possible upgrade to the ifi-Audio iPower power supply that currently supplies power to the hard drive enclosure. The TeraDak, at $150, is three times the price of the iPower. As its name suggests, it was designed as an upgrade power supply for Musical FIdelity's V90 DAC ($299). Figure 9. I am looking forward to hearing what the TeraDak Musical Fidelity V90-DAC linear power supply can do. I wonder if one of the better Pangea's would fare better in comparison.....like the Premier SE with silver plated Cardas grade one copper. Or maybe one of the Wireworld offerings in the same price range. 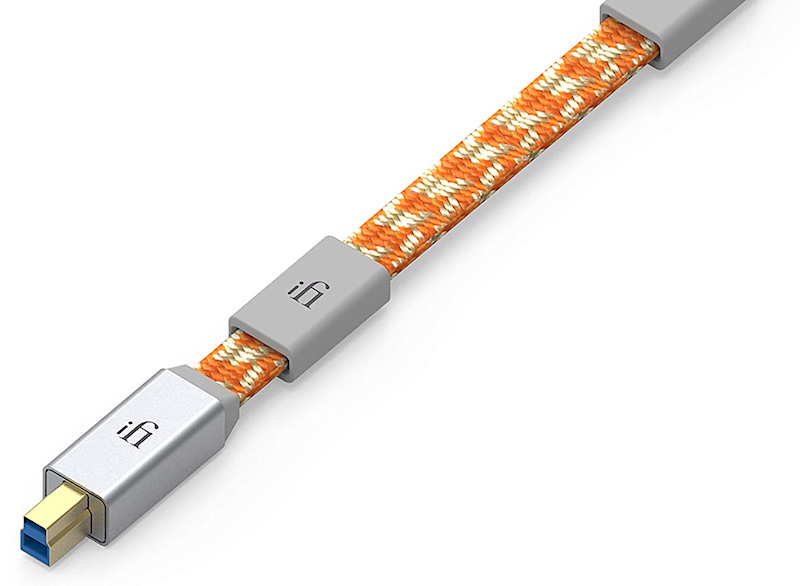 Pangea doesn't offer a USB 3.0 cable nor do they offer a USB 2.0 in the Mercury3.0's price range. 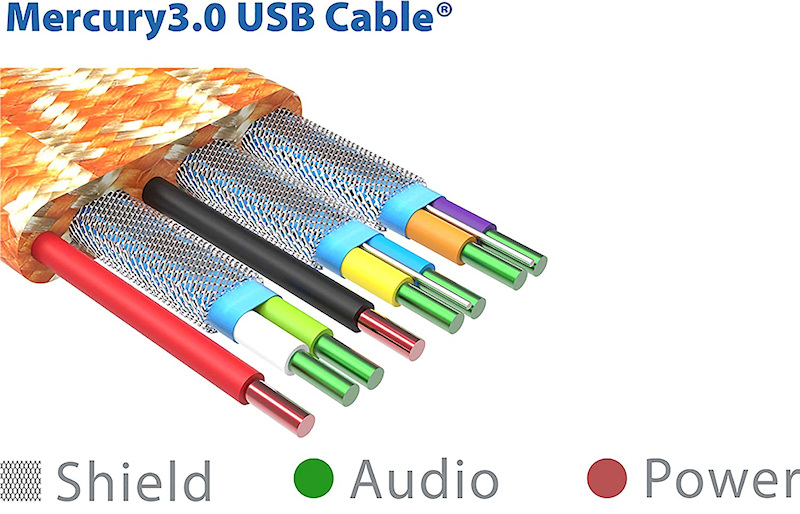 Wireworld's Starlight 8 USB 3.0 cable has some design similarities to the Mercury3.0 (flat cable, silver clad conductors), but it is priced significantly lower than the Mercury3.0.